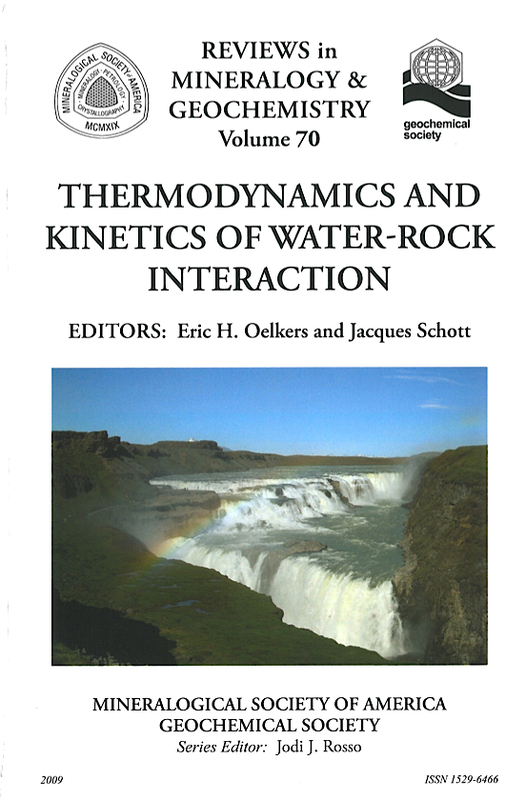 The chapters in this volume represent an extensive review of the material presented by the invited speakers at a short course on Thermodynamics and Kinetics of Water-Rock Interaction held prior to the 19th annual V. M. Goldschmidt Conference in Davos, Switzerland (June 19-21, 2009). This volume stems from a convergence of a number of factors. First, there is a compelling societal need to resuscitate the field of the thermodynamics and kinetics of natural processes. This field is essential to quantify and predict the response of the Earth’s surface and crust to the disequilibria caused by the various natural and anthropic inputs of energy to our planet. As such, it serves as the basis for sustainable development and assuring the quality of life on the Earth; it serves as the key to understanding the long term future of radioactive waste storage, toxic metal mobility in the environment, the fate of CO2 injected into the subsurface as part of carbon sequestration efforts, quantifying the quality of petroleum reservoirs and generating novel methods of petroleum extraction, and the identification of new ore deposits. 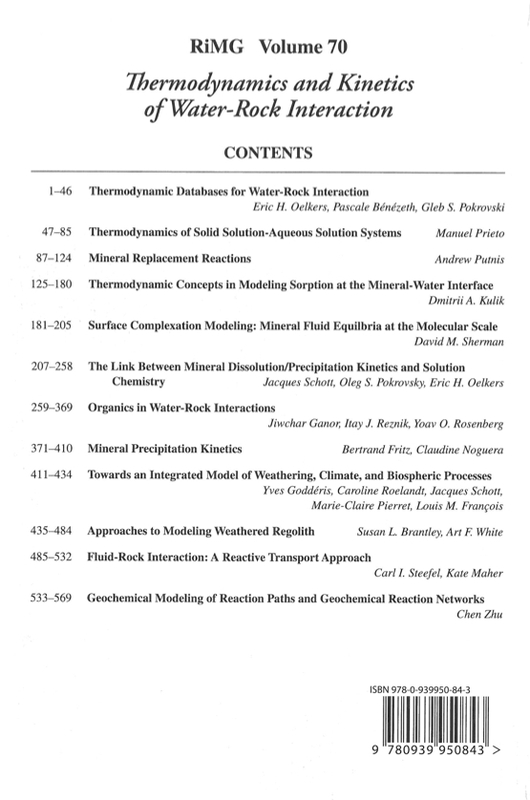 The recent interest in the weathering of continental surfaces and its impact on global elemental cycles and climate evolution has also brought new attention to the thermodynamics and kinetics of water-rock interactions as it has become evident that only a true mechanistic approach based on robust thermodynamic and kinetic laws and parameters can accurately model these processes. Yet, this field has, in many ways, atrophied over the past two decades. Relatively few students have pursued graduate research in this field; many of the great contributors to this field have retired or otherwise moved on. No doubt some of this atrophy was caused by economic factors. For roughly two decades from the mid-1980’s to the mid-2000’s the price of base metals and petroleum, when adjusted for inflation, were at lows not seen for over a generation. Some of this atrophy was also caused by past successes in this field; the development and success of computer generated thermodynamic databases, for example, giving the illusion that the work of scientists in this field was complete. A second factor motivating the creation of this volume was that it was requested by our graduate students. We currently coordinate two European Research Networks: MIR and MIN-GRO, and participate in two others GRASP and DELTA-MIN. As part of these networks we ran summer schools on the thermodynamics and kinetics of water-rock interaction in La Palma, Spain and in Anglet, France. In total theses classes were attended by roughly 100 students. By the end of these schools, we received numerous demands from our students requesting a book to help them follow the subject, as they, like most when introduced to thermodynamics and kinetics, got rapidly lost among the equations, symbols, and conventions, and standard states. This volume is an attempt to help these and others through these formalities towards applying the many advances available in thermodynamics and kinetics towards solving academic and societal problems. A third factor is that we felt this volume would be a great way of getting many of our friends to write up that review paper that we have been hoping they would write for years. The chapters in this volume represent our effort to do just this. We recall Dave Sherman first explaining to us how to perform first principle thermodynamics calculations at an European Research Conference in Crete, Greece during 1999. We recall that his explanations were so clear that we wished to have recorded it. Manolo Prieto gave in La Palma, Spain a lecture summarizing decades of research on the thermodynamics of solid solutions. This lecture opened up our eyes to how little we know about the chemistry of minor and trace elements, and how they can drastically alter the pathways of reactions in nature. He also made us aware of the thermodynamic formalism available for advancing our ability to quantify the behavior of these elements in complex natural systems. Another lecture we left knowing that we needed a permanent record of was that of Dmitrii Kulik on the thermodynamics of sorption in Jena, Germany. After leaving Dmitrii’s talk, we felt that we finally understood the differences between the various models used to describe sorption. Yet another chapter we felt essential to see published is a summary of the latest advances in mineral precipitation kinetics. We have followed the work of Bertrand Fritz for years as he developed a new formalism for quantifying mineral nucleation and growth, and in particular practical approaches to apply this formalism to complex systems. We are very pleased we were able to convince him to contribute his chapter to this volume. Other chapters we believed were essential to include was that of Andrew Putnis, who has gathered extensive evidence for the existence of mineral transformation reactions, a novel and widespread mechanism in nature. Through this volume we were able to get Andrew to bring all this evidence together in a single place, where we can see clearly the significance and pervasiveness of these reactions. Similarly Jichwar Ganor has, over the past two decades, gathered a variety of evidence showing how organic compounds affect both thermodynamics and kinetics. Jichwar’s chapter brings all this evidence together in one place for the first time. This volume is completed with the future of this field, the application of thermodynamics and kinetics to natural phenomena. Two of the leaders in the development and application of reactive transport modeling are Carl Steefel and Chen Zhu. Carl, who has written what may be the most advanced reactive transport modeling code currently available, together with Kate Malher has written an informative summary of recent advances in reactive transport modeling. Chen then shows how the use of these models provides insight into the relative role of dissolution and precipitation kinetics in natural processes. This volume finishes with insightful applications of reactive transport modeling together with field observations to understand chemical weathering from the centimeter to the regional scale by Susan Brantley, Art White and Yves Goddéris.